If you’re willing to work hard, you can go from couch potato to triathlon competitor in three months. More and more people are doing it. In fact, USA Triathlon, the nation’s governing body for triathlon races, is reporting record highs for memberships. The reason for the popularity of the triple-threat endurance sport is a result of many factors, ranging from a general shift toward healthier lifestyles to simply an increased number of races, including shorter sprint triathlons, making it easier for novices to try their first races. Triathlons usually consist of three disciplines — running, swimming and biking — although winter triathlons replace swimming with skiing or skating. A classic triathlon starts with a half-mile swim, which is immediately followed by an 18-mile bike ride, then is finished off with a four-mile run. The swim/bike/run event hasn’t changed much since the one considered to be the first modern triathlon took place in California back in 1974. There are races similar to triathlons, which you might choose if you’d rather concentrate on one discipline. Duathlons, for example, consist of three stages but replace swimming with a second running event, making it perfect for those participants who can’t or don’t want to swim, and for those involved in long distance running. Similarly, the aquathlon foregoes the cycling part of the race, while the aquabike is a swim-cycle event with no running. A workout with two exercises back to back, usually cycling and running, but can also consist of swimming and biking. These are done to get you used to what you’ll actually be doing in a triathlon. Refers to both the process of changing between disciplines and to the area where your gear and equipment is kept. Transitions are timed, so competitors actually train for each segment: T1, between the swim and bike; and T2, between the bike and run. A short-distance triathlon, often the first tried by newbies to the sport. It usually consists of a 400-meter swim, a 12-mile bike ride and a 3-mile run. The most widely recognized ultra distance event is the Ironman triathlon. When you think of triathlons, this elite event usually springs to mind. Known as the most difficult one-day sporting event in the world, it was started by a group of Navy SEALs who were debating whether running or swimming was a more physically demanding sport. The first Ironman was held in 1978 in Hawaii, and to this day the annual Ironman World Championship is in Kona. The original format of the Ironman calls for participants to finish the entire triathlon in less than 17 hours, with a time limit for each separate leg of the race. The Ironman 70.3 is half the distance, in each category, of the Ironman and accordingly is completed in half the time. If you’re an experienced runner competing in your first Ironman, a six-month training program will have you ready to swim, cycle and run — and complete the race, earning a lifetime of bragging rights. Allow as much as 12 months for training if you’re a complete beginner. You’ll find other events, such as the Indoor Triathlon Hour, that you can sign up for, as well. This 60-minute activity is a great introduction and can also serve as a training tool. Another benefit is that you don’t need to bring a bike because you’re on a spin bike or another stationary bike for the cycling leg. Mini-triathlons are an option, too. These are basically reduced versions of sprints, with the swim and running distances halved and the biking distance lowered usually to about 9 miles. In addition to selecting by distance, you can opt for a race that has a pool swim instead of a lake or other open-water swim. Choosing a flat terrain over a hilly one will also make the race easier, and if the event is being held in a place known for its windy conditions, see whether there’s an alternate race you can enter. In order to train and compete, you really don’t need much more than a swimsuit and goggles, a bike and helmet, and a good pair of running shoes. Upgrade slowly as you need to and can afford it (bikes alone can cost thousands of dollars), and find out what experienced triathletes recommend. For instance, although a wetsuit looks really cool, it’s only necessary when swimming in cold water and can actually make you overheat if the water is warm. As the bike ride is the longest part of the race, about half of your training should be dedicated to cycling. Swimming is next because it’s more skill-intensive than either biking or running, and the last is running. The rule of thumb is that you spend about an hour a day, five times a week, working out. You’ll only need to run 20 minutes, three times weekly, if you’re a novice training to compete in a sprint triathlon; any more time, and you risk injury. Incorporating strength training, such as squats and push-ups, is also something you’ll need to schedule. Tri-Newbies has a free training program [PDF] online that will have you ready for the sprint triathlon in 11 weeks. Your baseline fitness level for this program must be that you can swim at least 8 lengths of a 25-yard pool, run 2 miles and bike a minimum of 5-8 miles. The Tri-Newbies program guide has a calendar showing your daily workout; below that, you’ll find a detailed explanation of what each workout consists of. Note how they change in format, duration and intensity as you progress. For real couch potatoes, take a stab at Michael Pate’s training program. It’ll take 22 weeks to get you to the finish line, but as long as you can swim 50 yards, bike 2 miles and walk for 20 minutes, you can start training today. If you’re older and overweight and getting cold feet, take heart. Inspirational stories like The Old Fat Triathlete abound on the internet and in person, and pretty soon you’ll be helping others succeed. One area of training that is frequently put on the back burner, usually due to time constraints, is strength training. Personal trainer Patty Rivas of Reach Your Peak says that no matter how hard it is to fit strength training into your schedule, the benefits are just too good not to. 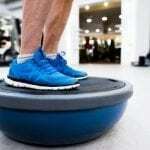 Her article is full of useful information, including how to multitask on the treadmill, why you should lift weights after a tough workout on the track, and five more strength-training tips for runners. With as many diets as there are athletes, you have plenty of eating plans to choose from. Choosing the best option for you starts with keeping a journal, tracking food intake, and tracking how you feel (“energetic” or “lethargic,” for instance). That way, you’ll have a better idea of whether you can tolerate milk or grains in your diet, or whether you would do better to eliminate them entirely. Endurance athlete and competitive marathon runner Nell Stephenson advises everyone to eat like a cave man (or woman). Co-author of The Paleo Diet Cookbook, Stephenson embraces a diet free of processed foods, grains, legumes and dairy, saying it’s “eating how we were genetically meant to be eating. Concentrating on clean protein such as wild fish and free-range poultry, unprocessed fats, and “tons of fresh vegetables and fruit,” the paleo diet is balanced and can be easily modified when a higher carbohydrate load is necessary, he says. On the other hand, nutritionist Teo A.W. Quay says a meal plan for endurance athletes might include whole-wheat toast at breakfast, cereal with milk for a snack, and a dessert of yogurt and berries. She also approves sports drinks and chocolate milk to boost carbohydrates during and after workouts. Whatever works best for you, Jené Shaw at Triathlete says there are some rules you absolutely must follow: eat your carbs before and after exercising, and add protein to them after a training session or race. And remember to always load up on fruits and veggies. Avoid high-fat, high-fiber foods for your pre-race dinner and morning-of breakfast. Eat breakfast 2–3 hours before your race. Stop drinking pop, juice and other beverages besides water, tea and Gatorade (after workouts). Joel’s pre-race breakfast is usually several scrambled eggs and a banana, and he says carb-loading is not necessary if you eat properly. Instead of thinking negatively (“I should have trained more”), McCormack advises you to embrace the pain and to concentrate on the rhythm, your stride, positive thoughts — anything that takes you one step farther. Recognizing that this portion of the race is something you’ve trained for and conquered, over and over again, in itself is a fact that can help you get through to the finish line. Traci Statler, Ph.D., a professor of sport psychology at California State University, Fullerton, underscores that last point herself. Training with friends is a big help, Statler tells Molly Ritterback at Fitness Magazine. The mechanism at work there is known as “social facilitation theory,” Statler explains. Rest “allows the muscles that you have broken down to heal and recover,” agrees Jeff Behar at BodyBuilding.com. Preventing injuries, such as those caused by overuse, make rest days crucial whether you’re actively training for a marathon or simply exercising as part of a healthy lifestyle. And resting isn’t always accomplished by just switching exercises, unless you’re consciously varying “the muscle groups you engage on staggered days,” says Chris Morell at FitBit. Dean also notes that too much exercise can make a good night’s sleep hard to achieve, and that a rest period not only helps repair muscles and joints but also keeps you from suffering mental fatigue. Balancing training with work and homelife is a matter of making choices, and most athletes in training incorporate early-to-bed, early-to-rise into their lifestyle to fit everything into their day. Nobody is busier than HARO founder, social media guru and family man Peter Shankman. The 2010 Cozumel Ironman has run some 15 marathons to date. In an interview with Kari Gormley, host of The Running Lifestyle Show, Peter said he balances it all by getting up early. He’s in the pool by 5 a.m. or he’s biking by 5 a.m. In fact, he gets up so early that he once was cited at 4:27 a.m. for running in New York’s Central Park before it opened at 6 a.m.
Run-ins with the police aside, the serial entrepreneur, speaker and author still advocates rising at dawn. Another entrepreneur and triathlete, Denis Oakley, addresses the work-life balance issue on Quora. He, too, says early mornings are the best time to train and adds that that partner support is crucial — you’ll be sacrificing late nights and approximately 15-20 hours weekly to training, after all. In the same Quora thread, Ironman Matt Rodgers suggests the “meet you there” workout. If you’re a complete novice, plan on just less than 2 hours to complete your first sprint triathlon. Depending on your level of fitness, of course, you could complete the event in a little more than an hour. You’ll have a good idea before race day as to how long it takes you to swim 100 meters, and whether you need a full hour to complete the bike ride. Add a few minutes per transition to your pre-race approximation, and then compare your total expected race time to similar events posted at TriFind. Although the open-water swim is by far the shortest event in a triathlon, it is the one athletes worry about the most. Olympian Jarrod Shoemaker, who was named the 2012 USA Triathlete of the Year, gives open-water swimming tips in his TriJuice article. “There are a few important techniques to think about when swimming in open water for your triathlon race: sighting, stroke efficiency, buoy turns and water entries and exits,” he writes. Substituting walking for running during part of a marathon will both conserve energy and delay muscle fatigue, he concludes. “My takeaway from the countless hours of reading scientific studies is that power hiking or walking are ways to effectively conserve energy and delay muscle fatigue during ultra marathons and, in some cases, can net a faster ultra marathon,” Mark writes. You increase strength by increasing the force requirements in your workout, runner and coach Pete Magill argues in Runner’s World. Because different types of hill workouts target different muscle fibers, it’s important to vary the exercises. While long hill runs build endurance, long hill reps are for strength, and short hill reps increase speed. In that article, Pete offers five hill workouts you can incorporate into your training. This last piece of advice is just as important as the others. Take stock of the fact that as a budding triathlete you are able to run, bike and cycle longer and faster than you might have ever imagined. Then, there are the peripheral benefits that get people hooked on triathlons: the endorphins, the sense of accomplishment, the camaraderie, the whole lifestyle. So, keep training hard, be disciplined, and do the mental work necessary to stay motivated. But in the end, remember that all this work goes toward creating a more healthy, more rewarding lifestyle for you.